Fanthology 1986 - ZineWiki - the history and culture of zines, independent media and the small press. 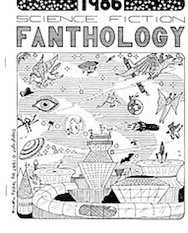 Fanthology 1986 was a science fiction anthology fanzine edited by Mike Glyer, Pat Mueller Virzi, and Dennis Virzi. Published in Texas, U.S.A. in 1987, Fanthology 1986 was 56 pages. It included the contributions "Fizz! Buzz!" by David Langford (Ansible), and "Thank You Girls" by Chris Priest. Other contributors of writing included Jeanne Gomoll (Janus), Patrick Nielsen Hayden and Teresa Nielsen Hayden (Izzard), Eric Mayer (E-Ditto), among others. Cover art is by Teddy Harvia. Contributors of interior artwork included Teddy Harvia, Brad Foster, Steve Stiles, and Taral Wayne (DNQ), among others. Pat Mueller Virzi also edited The Texas SF Inquirer, for which she won the Hugo Award for Best Fanzine in 1988. Her next fanzine, Pirate Jenny, was nominated for the 1990 Hugo Award for Best Fanzine. In the 2000s, Pat returned to self publishing with the title Pint-Size Stories. Since January 1978, Mike Glyer has published File 770, winning the Hugo Award for Best Fanzine four times, for the years 1989, 2000, 2001 and 2008. This page was last modified on 17 October 2018, at 12:43.